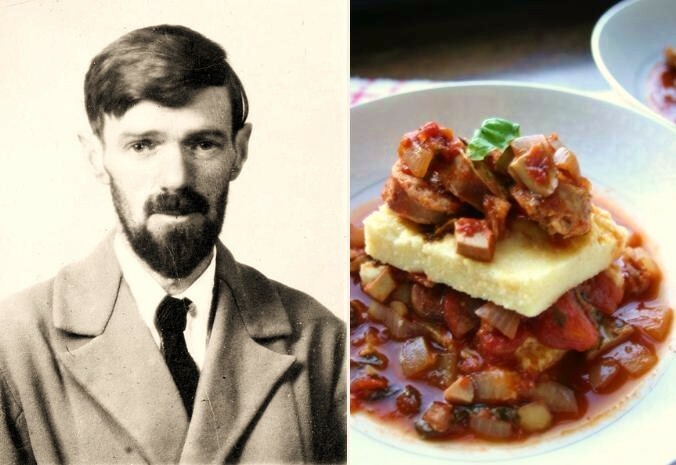 Lawrence didn’t stay away from Italy for long; in 1914, he and his wife-to-be, Frieda, returned for an eight-month stay, and began to cook again, focusing on the specialties of the north that they had come to love: risotto, polenta, and hearty sauces and soups. “We are cooking out of Mrs Waterfield’s book,” Frieda wrote in a letter home, referring to Lina Duff Gordon’s Home Life in Italy, a cookbook written and illustrated by two other ex-pats who lived close by. The book is now in the public domain, so you can browse through the recipes the Lawrences likely used, including one for D.H.’s beloved polenta, stirred until creamy then poured on “a wooden slab to the thickness of an inch” to harden into cakes. “Polenta, when made with a well-flavored sauce, is an excellent dish,” Gordon notes. She starts her sauce out with “the usual soffrito of onion, parsley, funghi, a sausage and some mortadella (bacon would do as well).” All those meaty flavors come together in this sausage and mushroom ragu. Serve à la Lawrence—with a liberal grating of cheese. 1. Combine milk and salt with 2 cups water in a small saucepan over medium heat. Bring to a boil. Slowly add cornmeal, stirring constantly, and reduce heat to low. Continue to stir 10 minutes, then add salt and pepper to taste. Pour polenta into an 8×10 inch baking pan. Set aside. 2. Heat oil in a large pot. Add sausages and cook until the fat is rendered and sausages start to brown, about 5 minutes. Transfer sausages to a plate lined with paper towels and set aside. 3. Chop onion, mushrooms, bacon and basil leaves in 1/2-inch pieces, then add to the remaining fat in the pot. Cook over medium heat until onions are soft, about 10 minutes. 4. Preheat broiler. Add tomatoes, broth and vinegar to pot, then lower heat and let simmer 10 minutes. Cut sausages into 1-inch pieces and add to sauce until cooked through, 5 minutes. Season with salt and pepper. 5. While sauce is reducing, put baking pan with polenta under the broiler until the top is crispy, 5 to 7 minutes. Remove from broiler and sprinkle cheese over the hot polenta. Cut into squares, top with sausage ragù, and serve. Fantastic post. Your writing iswderful and evocative, and you have a wonderful talent for not only teasing out en pointe quotations from the authors you highlight, but also for food photography and recipe adaptation. Kudos. Thank you, Kate, that means a lot. Finding fun quotes is one of my favorite parts of writing the blog. I found this one from Robert Louis Stevenson recently, which I’ll have to work into something: “I say, do take your macaroni with oil: do, please. It’s beastly with butter.” AGREED. This looks extraordinarily delicious, and I’m a huge fan of Lawrence’s work. Thanks for sharing this story — and this recipe! Thanks, Emily! I’m a big fan too, and I think there’s nothing so nourishing when you’re writing as a big warm bowl of polenta. Makes sense to me that he used it as some creative fuel! I’d like to go to Italy and do some “good work.” Sounds divine. Enjoyed this post! Thanks so much, Nicole. Always love what you’re doing – Eat This Poem is one of my go-to blog recommendations – everyone should read it!! This is one of the most creative blogs I’ve seen. Fantastic. My sister-in-law, who loves to cook, would love this blog. You make me very hungry! Thank you so much! Glad I could make you hungry – it’s a great thing to be. Hope your sister likes it! I don’t drop a leave a response, however I browsed some of the remarks here D.H.
keep up with you. Could you list of every one oof your sociial networking sites like your Facebook page, twitter feed, or linkedin profile?